Community bake sales are often a great way to discover someone else’s family favourites. Chances are people contribute their best recipes and if you’re lucky you can track down the recipe for a delicious discovery. We discovered these cookies at a Brownie bake sale when I was in grade three. They were made by my friend Julie’s mom so that’s why we named them “Cain’s Oat Cakes.” I still remember standing in our kitchen nibbling one for the first time, trying to eat it slowly to savour the taste since I’m sure there weren’t enough for any of us to have two. It was the best cookie ever --buttery with a little crunch. 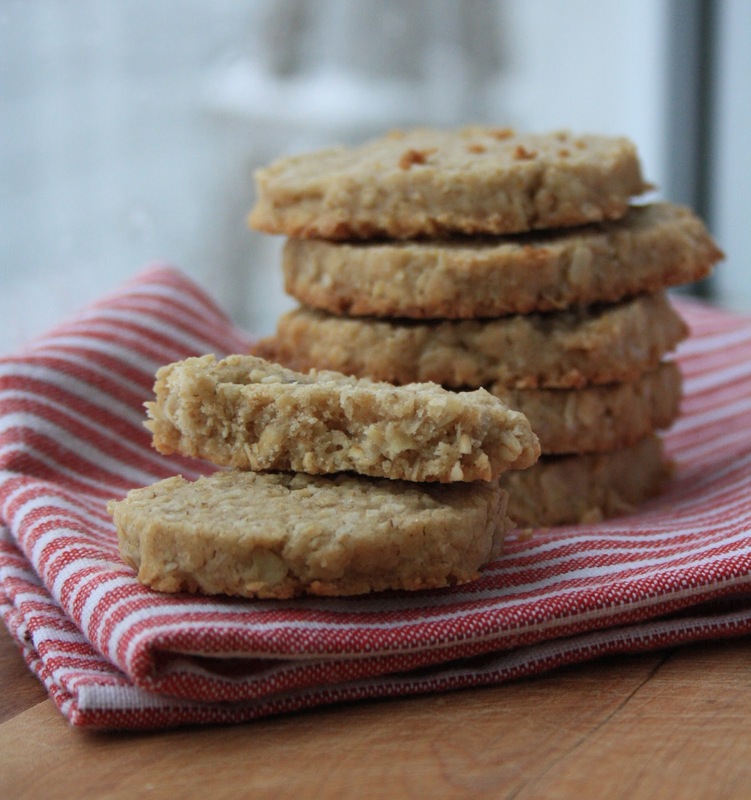 As far as cookies go you can’t get much simpler than an oat cake: flour, oats, sugar and butter. That’s why they’re one of my favourites. In my opinion the key to a great oat cake is to use good flour and oats. I use Speerville Flour Mill whole white flour (still has the wheat germ intact so is a little sweet and nutty) and Speerville rolled oats. Together they add a wholesomeness and lots of flavour. Real butter (in my opinion) creates the dividing line between good and great oat cakes. I’ll share the recipe as it came to us, although I usually make a half batch and use only butter (no shortening for me). You can add up to 2 Tbsp ground flax or wheat germ to this recipe. Another option: my sister used to press the dough into mini muffin tins to create little tarts that she’d fill with a dollop of jam. This kind of cookie is the ultimate in convenience since you can leave the chilled dough in the fridge and bake them when you have a few minutes to spare. Mix flour, oats, sugar and salt. Turn out onto the counter and pull the dough together. Divide in half and shape into logs. Wrap in parchment paper and chill for two hours or up to a week. Slice ½” rounds off of the logs and place the cookies in a parchment lined baking sheet. Bake for 10-12 minutes or until they are lightly browned.